Today it was cold here but very beautiful day. In this season when it is cold the air is very clear. 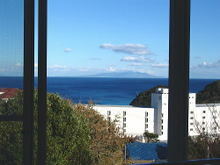 That’s why we could see some ships in the ocean and Izu Oshima island over there from the room of Sakuraya. 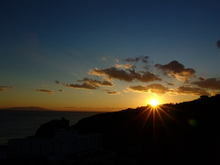 This entry was posted in Pension Sakuraya, Sea on 2006年12月29日 by izusakuraya. 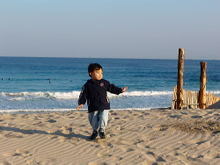 Before going to Shimoda for shopping my son and I went to the beach to take a picture. It was very warm in Shirahama today, so there were many people to take a walk. Some of them were in the water without shoes. We usually don’t see such scenary in this season because it is almost end of the year. …. This entry was posted in beach on 2006年12月23日 by izusakuraya. 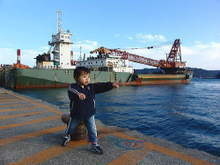 Today I had to go for shopping, so I went to Shimoda with my son, "Yuuki". After that, we went to Shimoda harbor to see the ships. "Look, Yuuki ! There are big ships overthere." "What is the name of that ship with the crane ?" Yuuki always reads the book of behicles as his treasure, but he couldn’t aswere my question. Because his book doesn’t have an information of that ship. "Don’t move, boy ! Watch your step ! There is a sea over here." By the way I am showing the picture of Shirahama beach….. . This entry was posted in beach, Family on 2006年12月21日 by izusakuraya. There was a little clouds in the sky this morning, but we could see a beautiful sunrise and Izu Oshima island on the left side. We have only 10 days this year, we can see the TV programs which tell something about Chiristmas and New year holidays everyday. I hope we will be able to see a beautiful sunrise like today on Jan 1st !! This entry was posted in nature on 2006年12月19日 by izusakuraya. 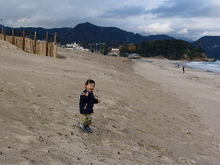 In these days I had been working in Sakuraya, so my son and I went to the beach by walking after some dasy. And then my son started to find something. "I found it, dad !" Yes, my son was looking for a branch. …. 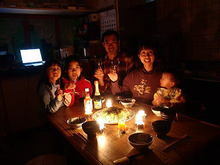 This entry was posted in beach, Family on 2006年12月15日 by izusakuraya. 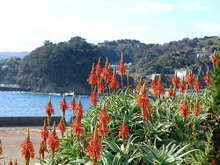 The Aloe’s Festival started to take place in Shirahama yesterday. The blooming of Aloe’s flower is a little earlier than usual. In this stage 70 or 80 % are bloomed. The peak of blooming of these flowers will be in new year holidays, I guess. This entry was posted in Flower, nature, Travel on 2006年12月10日 by izusakuraya. Today we had a little wind but it was warm this afternoon. How did you feel in your place today ? By the way this is a view from 2nd floor of our Pension. When I was cleaning up this room I could see Izu Oshima island over there, so I had a break to see it for a while. 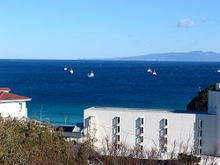 As the air is very clear in the winter we can see Izu seven island. This entry was posted in nature, Pension Sakuraya, Sea on 2006年12月4日 by izusakuraya. It was actually the ocean of phantom, which appeared there suddenly. The clooud was floating between rocks in the sky. There were some ships were drifting toward the end of the world. ……. I was very surprised with this fantastic picture when I saw it in my computer. 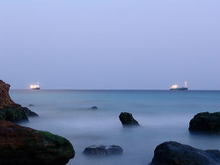 This entry was posted in nature, Sea on 2006年12月2日 by izusakuraya. Today, December 1st was our 15th marriage anniversary ! So my wife, my children and I cereblated together tonight. By the way do you know how to call the 15th marriage anniversary ? This entry was posted in Family on 2006年12月1日 by izusakuraya.